Recently, North Korea’s supreme leader Kim Jong-un “climbed” Mt. Paektu, the country’s tallest mountain. The mountain is an important place, so Kim Jong-un’s visit is very much a photo opportunity. A propaganda one, too. What better way to show that the leader is connected to the country’s ruling elite and has gotten over that limp than by having him climb 9,000 feet? In the snow. With no hat. And a fancy hairdo. Never mind that his shoes appear clean and polished and not caked with snow. Look at him and his hair battle the elements! In South Korea, numerous major news outlets ( here, here, and here, for example) have been pointing to one image in particular that, some allege, looks Photoshopped. That’s unconfirmed. What is confirmed is that the photo does look strange. The assumption is that the soldiers in the back are standing on a rock? Let’s get a closer look at the specific part that is raising red flags (pun totally intended). On one side, there appears to a soldier’s hand propping up a soldier that is standing on something. This apparently looks cropped. In the group that is elevated, the spaces between the soldiers’ legs are totally white, and we cannot see the legs of the soldiers behind them. We can see the volcanic crater in the background. Also, if they are standing on a rock, we cannot see that, either. The shape of whatever they are standing on is most peculiar. The soldiers in the back are piled up on who-knows-what. It’s like they’re suspended in air. Maybe they’re not. Maybe they’re standing on a funny-shaped rock. Maybe they’re standing on other soldiers. I just hope jetpacks are involved. This is a rather odd photo! No wonder it’s made the TV news in South Korea (above), with the question being whether that the image might have been altered in some way. Here is a wide shot that shows you the kind of rocks that apparently can be found on this summit. There are other photos in the set that do look more natural—as natural as a dictator surrounded by his loyal followers can look. But, in those photos, you don’t get a view of the mountains in the background. 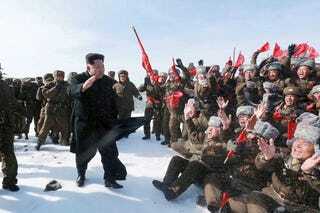 You do get Kim Jong-un sitting in the snow. Over the years, North Korea has been infamous for its Photoshops—many of them not very good. If this is a Photoshop, it might be one of the better ones. If it’s just a photo, it’s a goofy one at that.